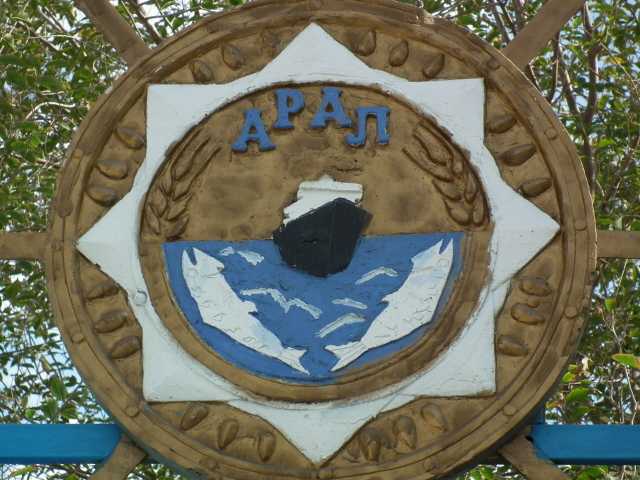 This poor town used to be the main fishing port on the Aral Sea, before the latter began drying up. It's still the main settlement in the North Aral Sea area in Kazakhstan and thus the natural base for exploring this desolate part of the world. The town itself also has a few points of interest to the dark tourist. But it is certainly no picnic getting (and staying) there. Only for the really dedicated. 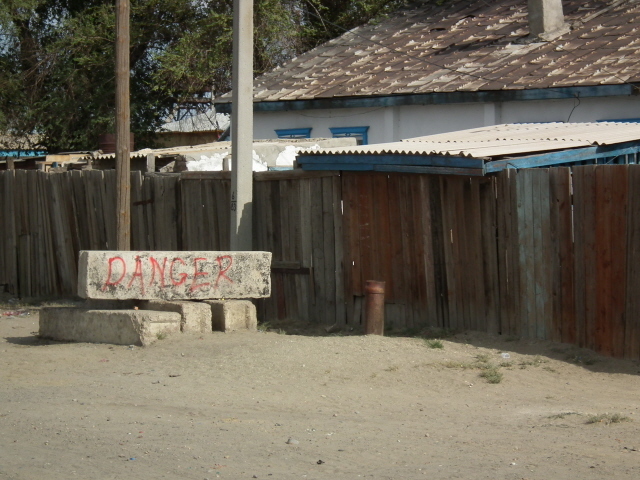 More background info: see also under Aral Sea for more general background information about the whole area. 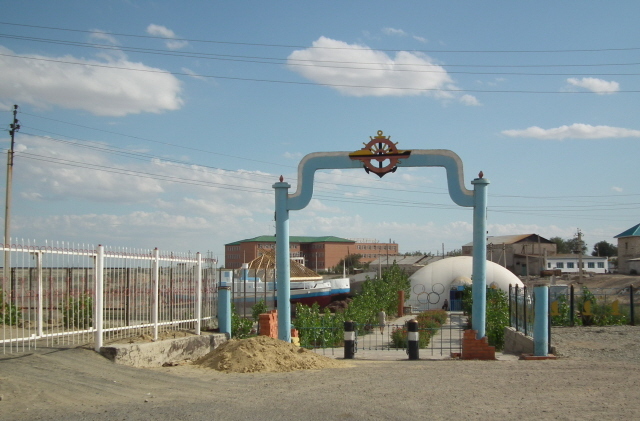 The town of Aralsk, also known by the shorter name Aral, only came into being with the arrival of the Tashkent-Orenburg railway in 1905. 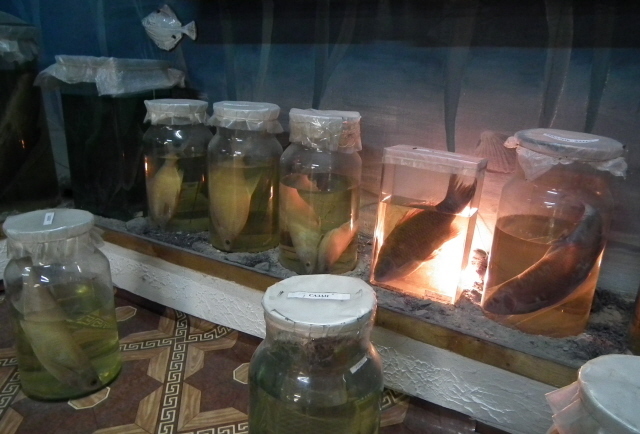 It soon began developing rapidly, thanks to the rich fishing grounds of the vast Aral Sea. 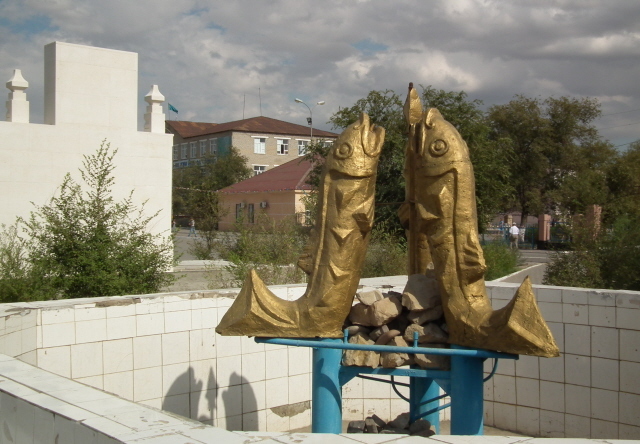 Parallel to Muynak at the lake's southern end in Uzbekistan, Aralsk became the main fishing industry town at the northern end of the Aral Sea. Aral's finest hour came in 1921, when the fishermen of the town heroically responded to an appeal by Lenin and provided more than a dozen trainloads full of fish to be sent north to feed to the hunger-stricken population in Russia and other parts of the newly created Soviet Union. 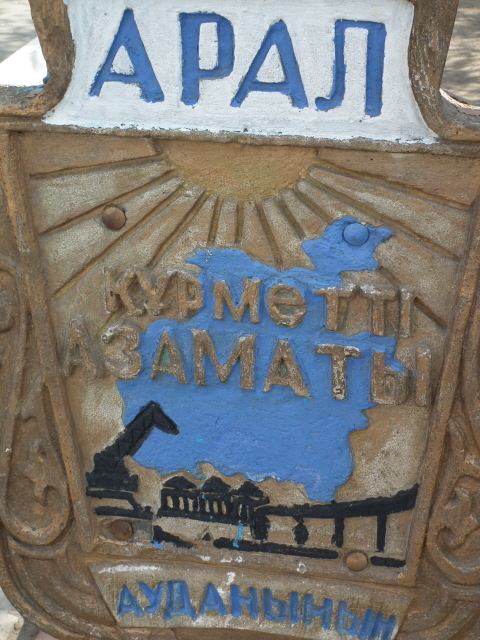 The fishing industry of Aralsk continued to prosper until the 1960s. 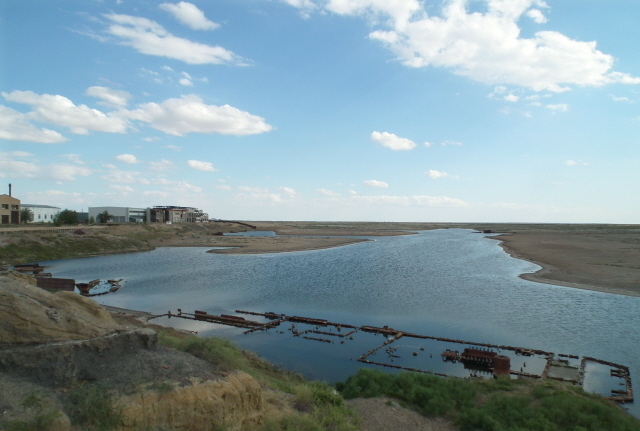 Then the well-known man-made disaster began to strike: the two rivers feeding the Aral Sea, the Syr Darya and Amu Darya, were partly diverted and tapped into on a massive scale mainly to provide irrigation for the rapidly expanding cotton-growing industry further east and south-east in Uzbekistan and Turkmenistan. With less and less water reaching the Aral Sea, it inevitably began to shrink. The fishing ports on its edges were naturally the worst hit, as their harbours dried up, cutting them off from the fishing grounds. Worse still, the increasing desiccation precipitated a decline in the numbers of fish – and as the salinity of the decreasing waters rose, it eventually became too deadly to support any life any longer. So the declining fishing industry collapsed altogether. The people living on shores of the Aral Sea not only had to face the fact that their livelihood was disappearing. 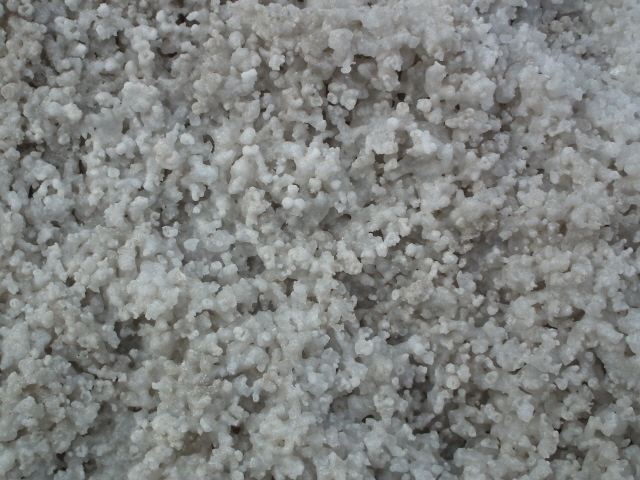 The dried up seabed also posed a direct threat to the local population in its own way too: salt and deposits of the heavily applied chemical fertilizers of the cotton industry further upstream were blown about over the land and now posed a considerable additional health risk. 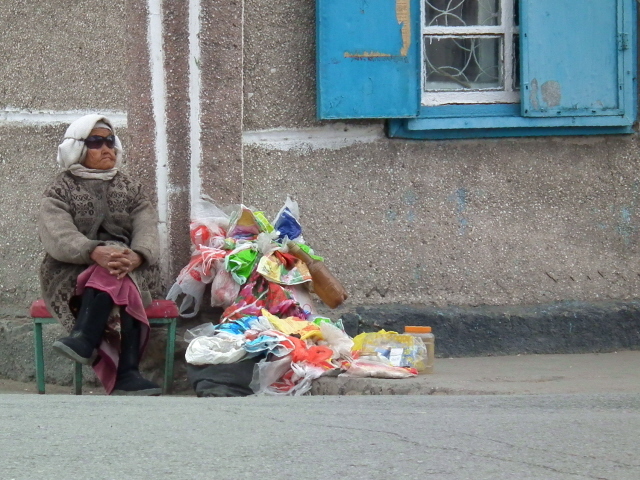 Today, Aralsk is an impoverished town, with a much reduced population of ca. 35,000 inhabitants. Many live off cattle or camel breeding. There's evidently some government support to alleviate the deprivation somewhat, but the truth remains that the place is still but a shadow of its former self. However, things may be looking up: hopes for a comeback due to the rising waters of the North Aral Sea thanks to the Kokaral Dam (see below) still have to come true, but there is talk of a canal providing access to the raised waters of the lake which could eventually revive Aral's fishing industry. If, and it's a big 'if', the revived fish stocks prove sustainable, that is. Yet, fish have indeed reappeared since the water levels began rising – thanks to the dam – by as much as 30 metres (100 feet) already. And the hopes for a revival of Aral's fishing industry are most visibly expressed in the form of a spanking new fish processing plant on the south-western edge of town that is ready and waiting for the fish to arrive. For the time being, Aralsk remains a desolate, extremely remote place – which adds an extra in-the-middle-of-nowhere dark attraction to it, but also means that there is very little in the way of tourism infrastructure. It is, let there be no doubt about this, an extreme travel destination by any accounts. What there is to see: the town itself could not be less touristy even if it tried really very hard. It's a hole. A dump. A poor, desolate, remote, almost forgotten, dusty, depressing dump. But that makes it kind of cool in a dark tourism way too. 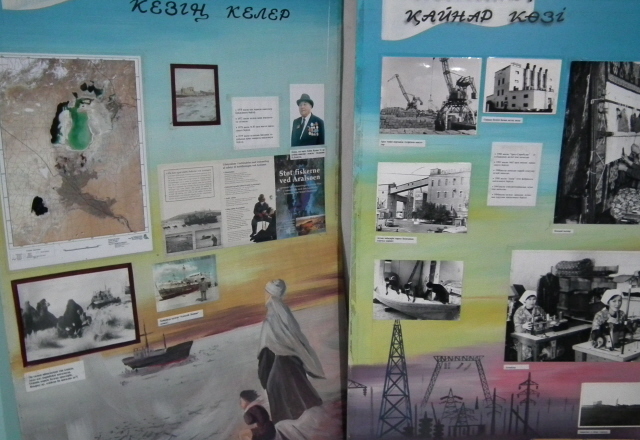 And it is the only realistic base for exploring Kazakhstan's North Aral Sea area. 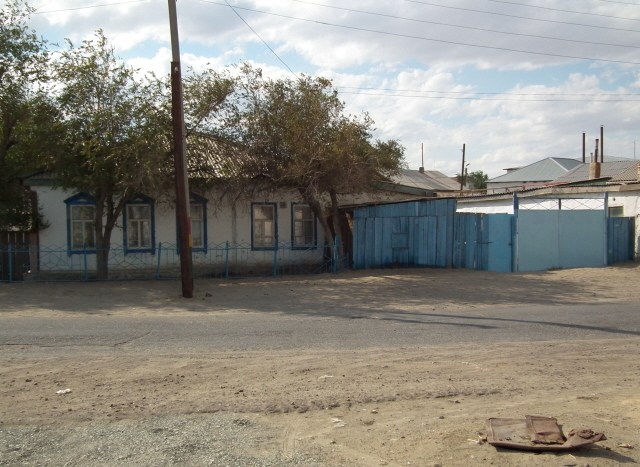 Aralsk is mostly characterized by low, single-storey residential housing spread out along a sprawling grid of dusty streets – some paved, others just dirt tracks with desert sand drifts. You can see camels, cows and donkeys in the street (and, fittingly, lots of children). The overall atmosphere is one of striking poverty. It is only partially offset by the activity at the town's bazaar and the few bars dotted around. What little contact with people I had was, however, friendly (but you do get a lot of strange looks, wandering the streets as a tourist and taking pictures). 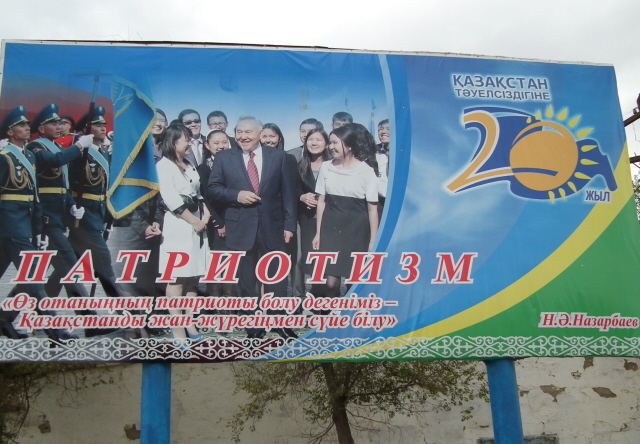 Another thing that is striking about Aralsk is that all those posters showing President Nazarbayav and glorifying independent Kazakhstan's achievements are not accompanied by any of the usual commercial billboards, like elsewhere in Kazakhstan. State propaganda is all there is on any hoarding you encounter here. Arguably it'll take a lot of propaganda to bring anything like the celebrated "patriotism" (as depicted on one poster ) to a deprived place like this … but it's still very odd to behold. In stark contrast to this, there is also one notable leftover from Soviet-era propaganda celebrating the glory days of Aralsk. It's a mosaic inside the train station building and depicts in full socialist-realist style that famous episode in Aralsk's history when the local fishing industry answered Lenin's cry for help and supplied trainloads of extra catch to the hunger-stricken population in the young Soviet Union after the upheavals of the revolution. 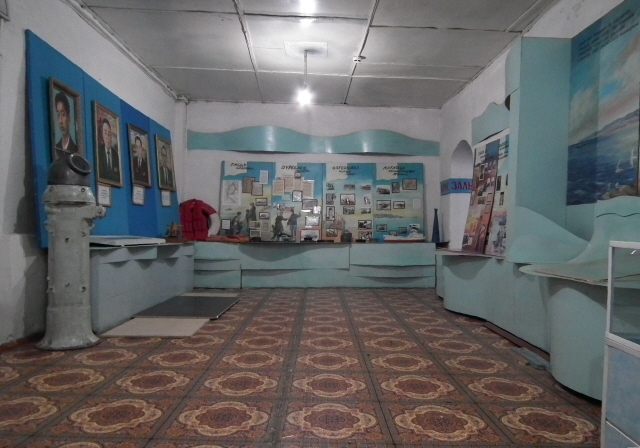 The museum is located on Tokey Esetov Street just a few steps north from its intersection with the main street, Abulkhair Khan Street; open Mondays to Saturdays 9 a.m. to 12 noon and 3 p.m. to 6 p.m.; admission 200 KZT. Nominally, photography is a bit restricted: you're supposed to pay 50 KZT per shot. 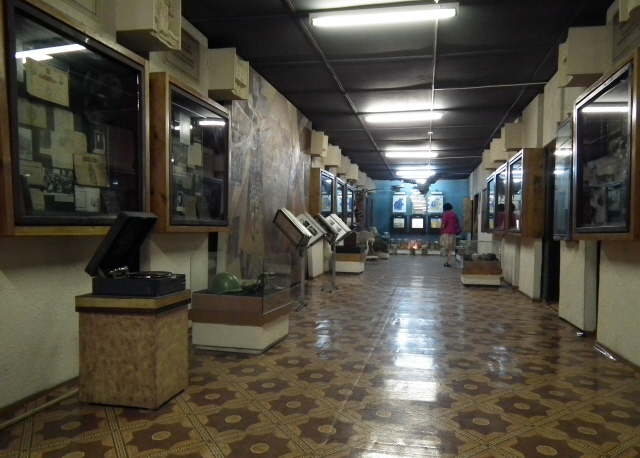 And even though it was not policed and payment could thus easily have been evaded, I couldn't bring myself to "cheat" in this endearingly decrepit museum. Just don't. 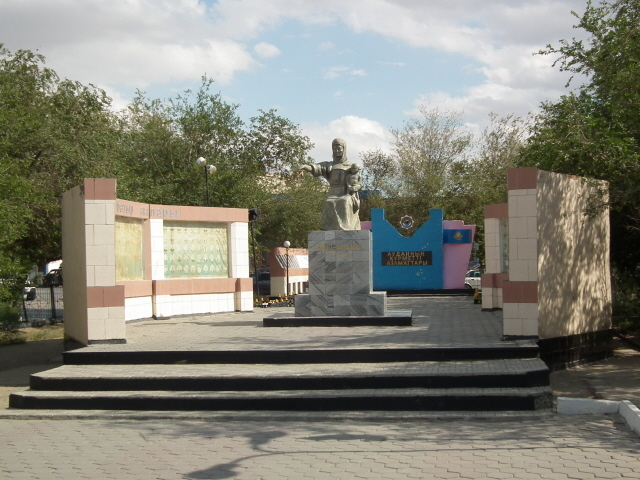 Just to the north-west of the museum is Aral's central square. 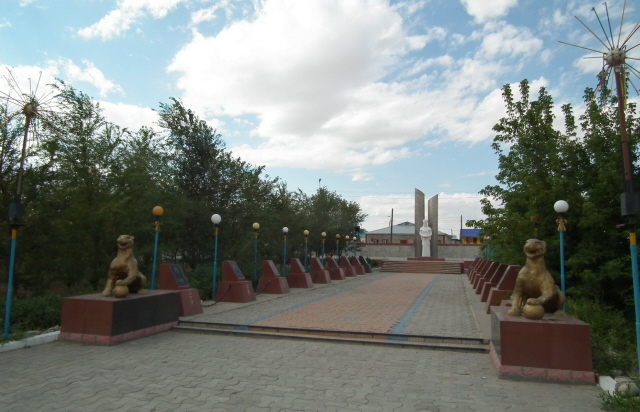 It's a rather bare, wide-open plaza with a couple of local government buildings (including the Akimat) on the edge, as well as a few memorials that are worth a quick look. Firstly, there's the obligatory war memorial in the north-western corner. It's not as glorious an example as in other, bigger places (cf. e.g. 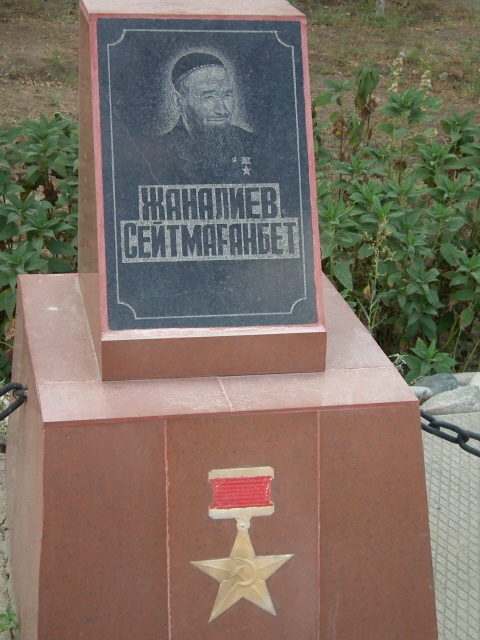 Karaganda or Semey), but some of the individual memorial stones along the central alley are quite intriguing. More remarkable, however, is the Mothers Memorial in the south-western corner of the square. It's supposed to celebrate the high birth rates achieved by the townswomen – but if you look at the many individual portraits on the faded black-and-white photos lining the memorial's side walls, the stern faces of the honoured women do not exactly suggest bags of fun. 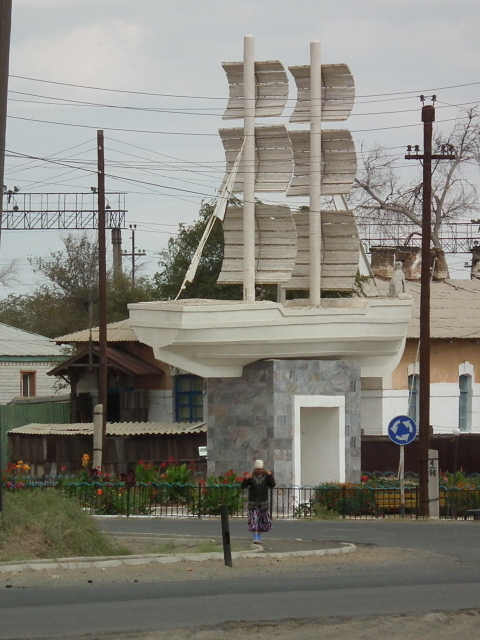 Similarly faded from olden days glories are some of the town symbols set into the fences of the square: some show a full-size Aral Sea and a thriving harbour, others a ship plying the lake's waters in which some whale-like oversized fish gasp for air (presumably that last gasp before being caught). It is, however, back to reality at a fountain nearby: the water was clearly supposed to spout out of the mouths of three upwards-reaching fish – only there is no sign of any water and the fountain's basin is as dry as the town's harbour. 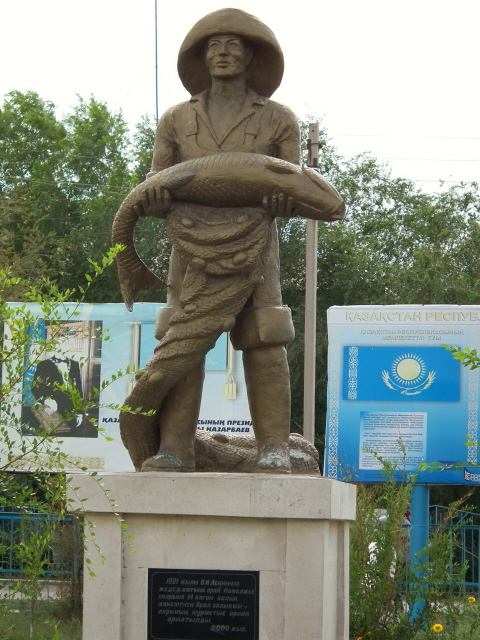 Behind it, however, is a plinth on which stands a proud bronze statue of a fisherman holding a big fat fish. When I was there, some refurbishing work was under way on further monuments, and government posters suggested bigger plans for the spot. Just to the north of the central square, en route to the local bazaar, such plans have evidently been put into reality already: a tall, brand-new-looking Independence Monument occupies another large square here – as it does in so many places in Kazakhstan these days. Another new – and decided kitschy – monument is that of a clean concrete ship on a granite stone plinth standing by the main road further out towards the train station. It's a very incongruous sight and looks like an unfinished Terry Gilliam film prop dropped straight out of the sky. 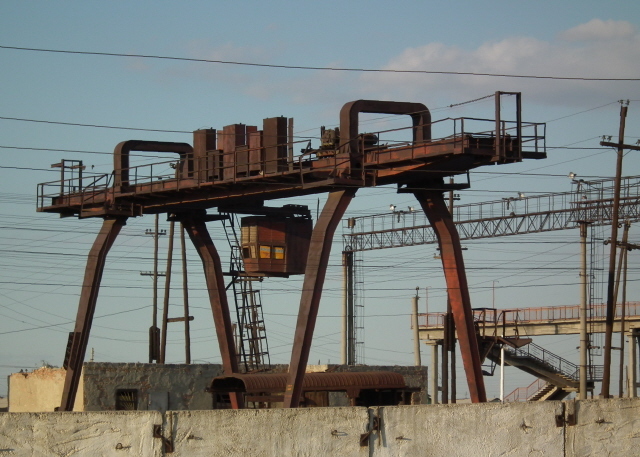 It also contrasts maximally with all those rusting cranes of the former freight train station or the many abandoned industrial buildings in this part of town. The most stunning example of architectural dereliction, however, can be found outside the town proper to the south-east, past a couple of smaller salt lake patches. Here a few ruins of a Soviet military garrison town still stand in a dramatic semi-collapsed state – an ensemble of ca. three-and-a-half former residential blocks, whose white five-storey facades still more or less hang in there (in some cases quite literally, precariously – so keep your distance!). The rest of the area, which used to be out of bounds to the locals, has been razed to the ground and scavengers have dug up what they could. So the housing ruins stand as very odd and unlikely survivors (just about) in the emptiness … very eerie! More ex-Soviet military ruins can be found to the north-west of Aralsk (just off the main road to the left) – at the site which was the airport that used to supply the biological weapons research facility on Vozrozhdeniya Island in the middle of the Aral Sea (now desert). 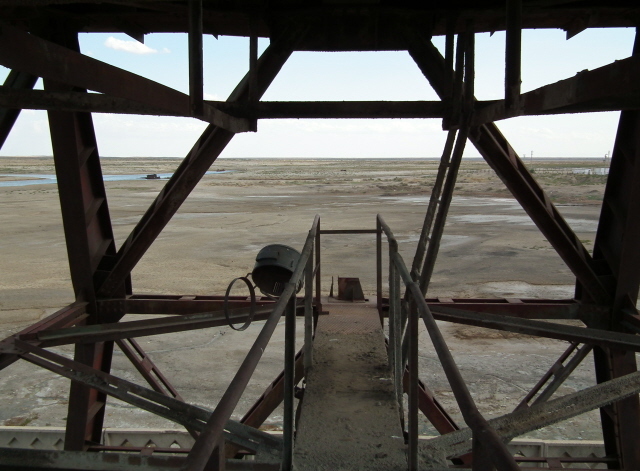 Some radar tower installations may still be standing but otherwise the airport is completely gone. Today, incidentally, the town no longer has an airfield and is totally dependent on its rail links and roads. 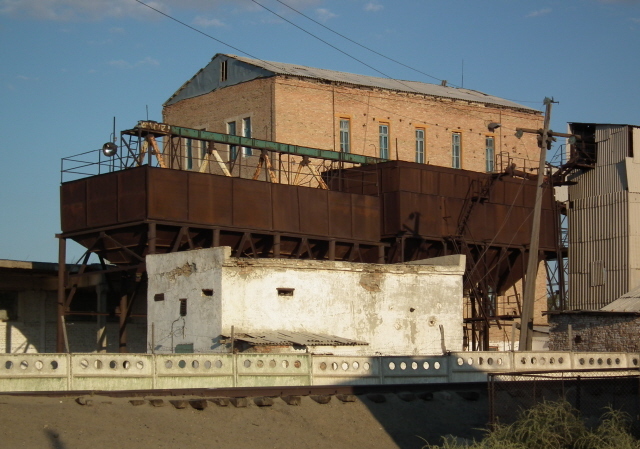 Most crucially, however, it was the town's waterway connection disappearing that spelt doom and gloom for Aralsk more than anything else. This is more than likely the main reason for any dark tourist to come here – to see the effects of the desiccation of the Aral Sea. And indeed, Aralsk's former harbour provides one of the starkest sights of this sort. The harbour is not in fact completely dry, but nearly. 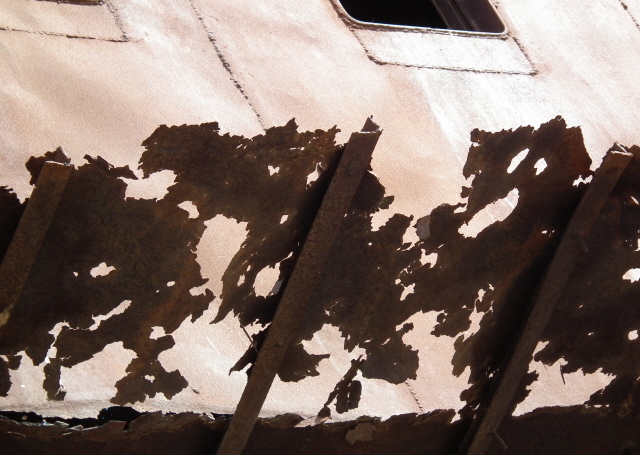 Some small puddles remain in the harbour basin, and remnants of rusting ships litter the edges. Some have nearly rusted away completely with little more than the main engine block still poking out of the shallow waters. 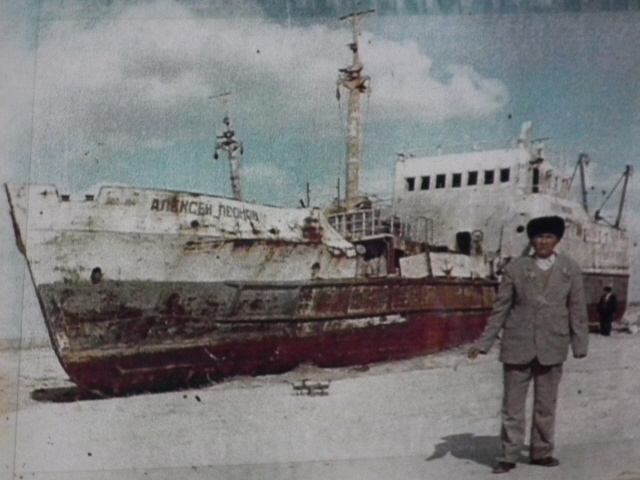 An ensemble of stranded fishing boats is currently being turned into a memorial of sorts. Two smaller boats have been given a fresh lick of paint and have been placed on a pedestal. 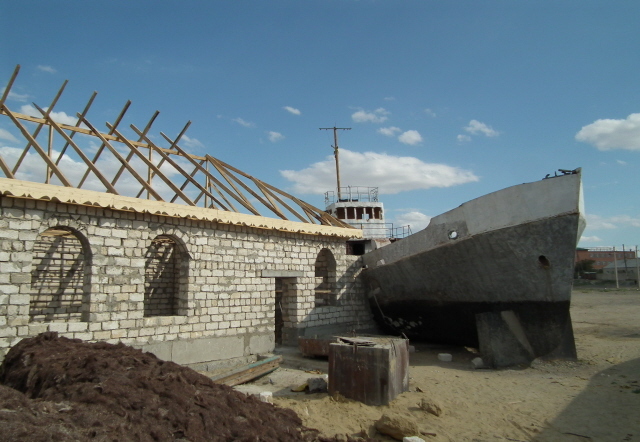 At the time of my visit in August 2011, another, somewhat bigger boat, was in the process of being overhauled and incorporated into a new museum. A museum building was under construction – directly adjoining the boat (presumably you will be able to walk from the building into the ship's hull through a cut-out at the point where they are conjoined). One of the workers at the site said the museum was scheduled to open within just a couple of months – but it didn't look like they were that close to completion to me. Whatever, by the time you read this, the new museum may well be operational. It has the potential of adding considerably to the dark tourism appeal of Aralsk. Whether or not it fulfils that promise remains to be seen. The new memorial and museum site can be found by walking down the central square, straight across Abulkhair Khan Street and down Makataev Street, past the grim Aral Hotel towards the western edge of the old quayside. 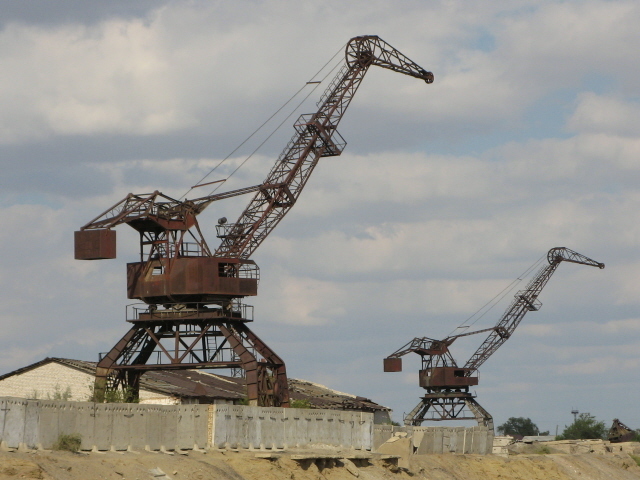 From here, you can also see what used to be the main central quay – with its two rusting cranes constituting what is probably Aral's most iconic landmark. To get close to the cranes you'd have to make your way through the little side streets behind the quayside and the Aral Hotel, past scrapyards and poor housing, ignoring the graffiti on a concrete block by the wayside that spells out "danger" in red paint, and eventually turn right towards the quayside wall. There's a little gap near the crane at the eastern end of the central quay. 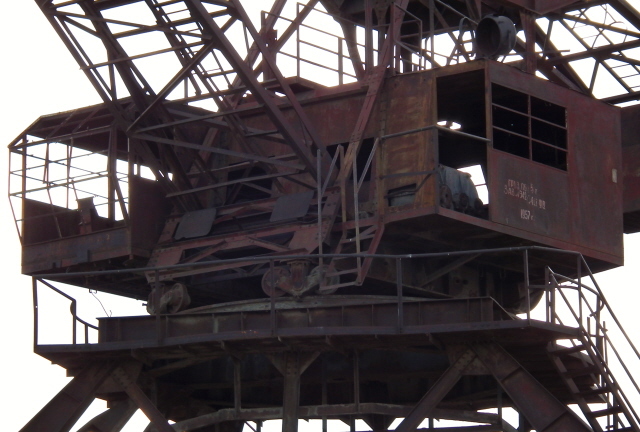 There are no signs saying "no entry" or anything, so in theory you can just go in … and proceed to explore and even climb part of the larger (western) crane. When I did so, my wife was a bit apprehensive about this, but no one ever bothered us. I only went up as far as the control cabin / engine level, from where further access was more or less blocked and I didn't want to overdo it on the acrobatic climbing front. Still, there was a good view over the harbour from up here. Very cool. 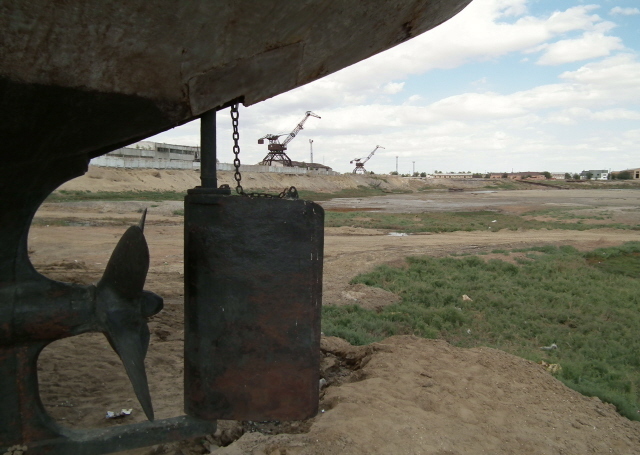 The sight of Aralsk's rusting old harbour may be the most striking testimony to the Aral Sea disaster within the town's perimeter. Yet the absolute No. 1 dark attraction for virtually all tourists who make it here is to get out of Aralsk itself and make an excursion to one of those iconic ship cemeteries. You may have seen some of those famous images of camels roaming between stranded fishing trawlers. They have become something of a symbol of the whole Aral Sea tragedy. However, they are disappearing. 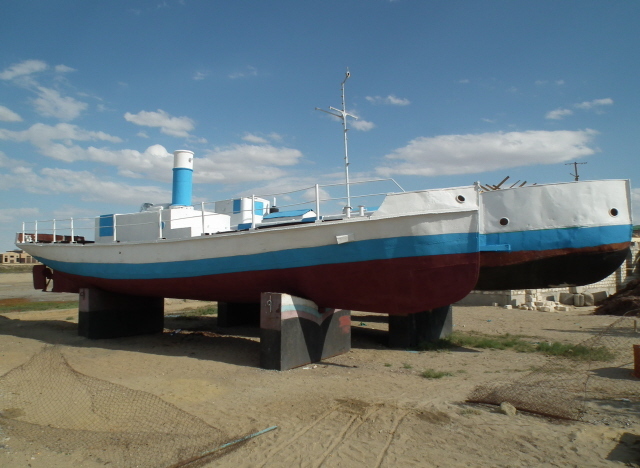 The most easily accessed of the northern Aral Sea ship cemeteries has always been that of Zhalanash. Once there were about a dozen vessels stranded here on the former seabed by what was once a bay (near the small village of the same name). Over the past few years, however, they have been cut up for scrap (and the metal sold on to China). 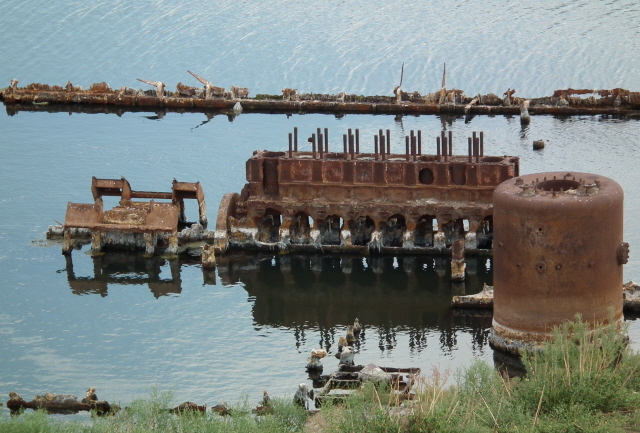 By 2008, when the Bradt guidebook to Kazakhstan came out, they were already down to just six rusting vessels. When I visited the site in August 2011, there were only three partly dismantled wrecks left. Two of these were just parts of a stern and bow and the bridge house lying bare in the steppes and sand without a hull. The once large trawler Alexei Leonov was somewhat more intact still, although it, too, had lost most of the steel plates of its outer hull. The large bridge superstructure was still towering high, though, and as such the sight was still rather impressive – though certainly not as much as it once must have been. The sad news is that what remains of the Zhalanash ship cemetery will probably be gone altogether very soon – my guide reckoned within a year or so. That means that by the time you read this it is more than likely that there is no longer any point in making your way out to this forlorn place. It's just minor, short-term interests in making a little profit from the scrap metal that have made the area's prime tourist attraction disappear – but who could blame them for it. It's not like the tourists come in droves and make the whole area flourish. There is allegedly another ship cemetery on the (former) Aral Sea's northern part, but I was told that this is some 80 miles (120 km) away from Aralsk and would thus require even a substantially longer drive, probably all day, if you're to make it as a return excursion. And to be honest, as long as there are wrecks in Aralsk harbour, right on the doorstep of the town, then the effort of seeing those in the desert may be disproportionate, unless you just get a kick out of being in a desert as such to start with. To sum up: Aralsk is an extreme destination that is certainly not for everyone – but if you're prepared to forego typical tourist creature comforts and make the considerable effort of coming all the way to this lonesome place to see the effects of the Aral Sea catastrophe at first hand and up close, then there's indeed no place quite like it. In that sense it can be rewarding. But tough it sure is. Location: in the Kyzylorda region in the south of Kazakhstan, on what used to be the northern shores of the Aral Sea, near the border with Uzbekistan. 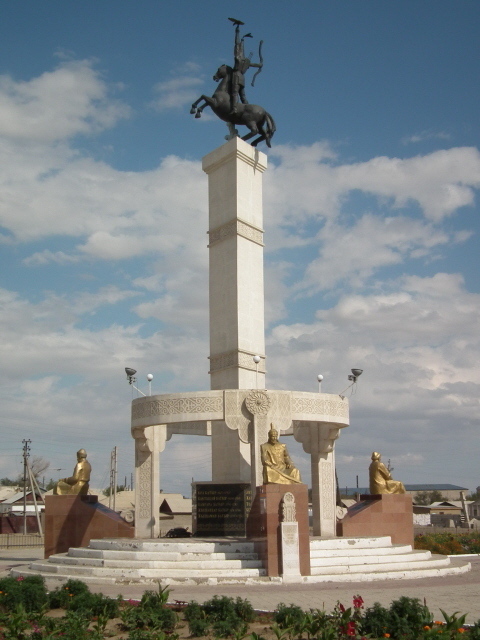 Aralsk is a good 800 miles (1300 km) west of Almaty, 250 miles (400 km) from the regional capital Kyzylorda, and ca. 500 miles (800 km) east of the shores of the Caspian Sea. Baikonur lies ca. 110 miles (180 km) to the east of Aralsk. 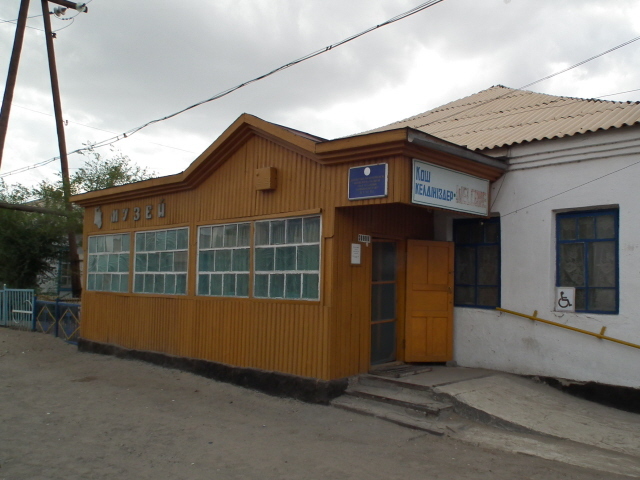 Access and costs: very, very remote indeed, but served by a main train line, so relatively easy and cheap to reach, but time-consuming; tour packages are not cheap, but not as excessively priced as some other parts of Kazakhstan. Details: in theory you could simply get on a train and get out at Aralsk – the town is on the main line between Tashkent and Orenburg. The journey from Almaty takes a endurance-testing 36 hours, but tickets aren't expensive. You can cut the journey time by first flying to e.g. 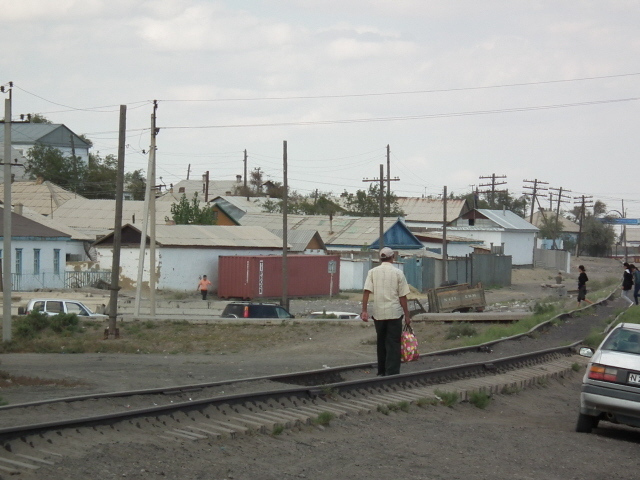 the regional capital city of Kyzylorda and taking the train from there (which then "only" takes ca. 9 hours). The line also passes through Shymkent and Turkestan (see Kazakhstan in general), so there's more options for breaking the journey. The problem is, however, that Aralsk isn't the sort of place where you can simply drop in and expect to find facilities such as tourist accommodation. In fact, there aren't any genuine tourist accommodation options to speak of. 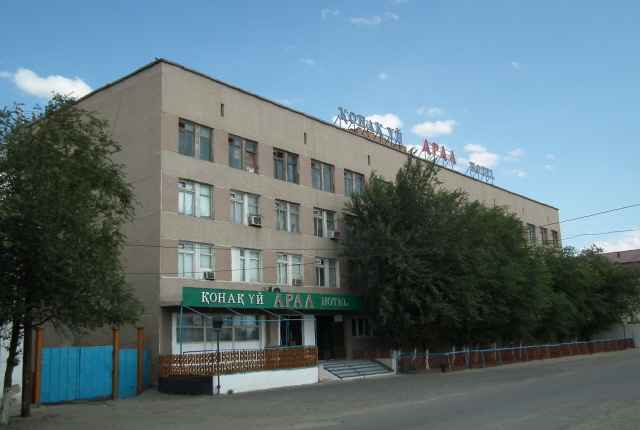 The Soviet-era building of the Aral Hotel still stands, OK, but its appearance is decidedly dodgy, to say the least. 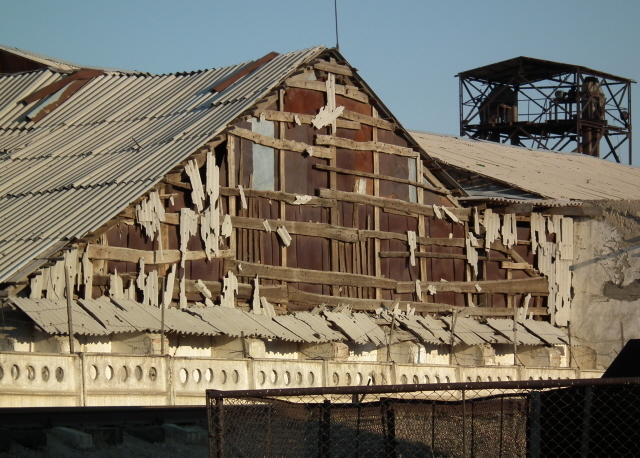 The upper floors look boarded up and the lower ones too don't appear to have been used in a while either – even though the 2008 Bradt guidebook to Kazakhstan still listed the place together with indications of the price brackets (low) and an rough assessment of the quality of the place (even lower). To me it seemed dead. But I didn't actually try to go in and enquire (it was that uninviting a sight). The travel agent who organized my trip there alleged that one floor has recently been bought by some Chinese company and plans for refurbishment may be in the pipeline (just don't quote me on that), but at the same time confirmed that for the time being this "hotel" is not really an option (it has no running water, for instance). Instead, most visitors are steered towards a homestay – and obviously, this should be organized in advance. Do not, however, expect any degree of luxury – rather the opposite. OK, there may be running water, your host will provide simple meals, but the sanitary facilities are of the most basic sort imaginable … other than none at all. (No, in fact I take that latter point back – "none at all" would actually have been an improvement … I, at least, would have preferred to go in the open desert than … but let's not go into details …). Anyway, unless you want to get stuck on your own in this godforsaken place, you have to plan well ahead and use an agent/ tour operator who can make the necessary arrangements for you, including the essential homestay accommodation and excursions.I found Kazakhstan Tours a most competent agent – it is given its own sponsored page here. Time required: depends – if you just want to see the desolate town and maybe make one excursion to the Zhalanash ship cemetery, then a single day may do. If you also want to take in those Soviet military base ruins, the museum in town and even a trip down to the Kokaral Dam, then you have to factor in two, three or even four days. Combinations with other dark destinations: not really anything that's round the corner, but still: the nearest place to Aralsk of any interest has to be Baikonur, the old Soviet Cosmodrome from where Gagarin took off to be the first man in space – and where the Soviet military ICBM programme was born too. Baikonur is en route on the same train line from/to Almaty. From Aralsk the ride to Baikonur (the station is called Tyuratam) takes about six hours or so. 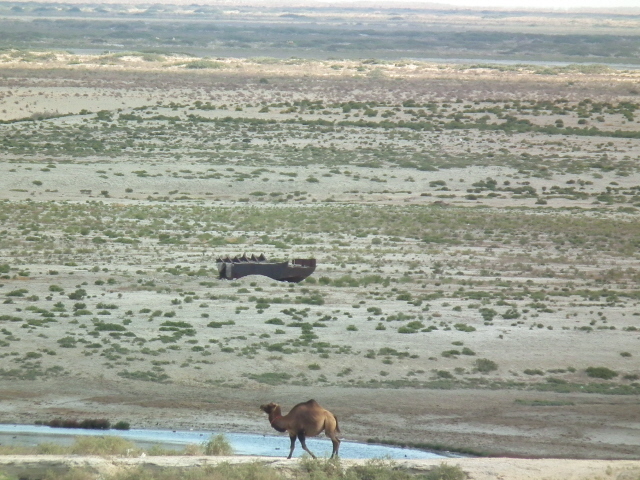 Those who miss out on the disappearing Zhalanash ship cemetery may still find more and somewhat better preserved counterparts by the southern Aral Sea in Uzbekistan, north of Muynak. 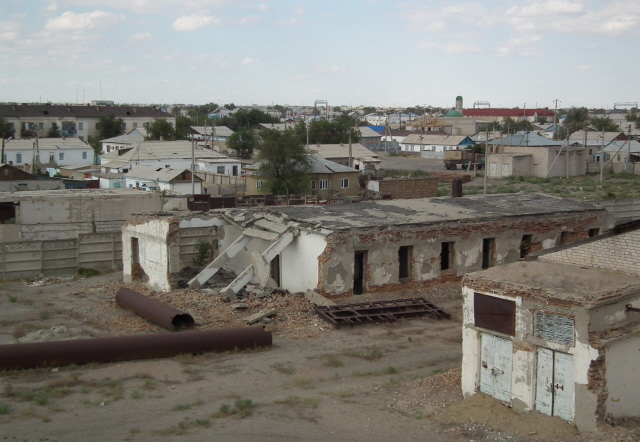 Note, though, that these wrecks are also gradually being scavenged for scrap – and in any case they are by no means any easier to reach; and not at all from Aralsk – you'd need to go via Nukus in Uzbekistan, which in turn is best reached by plane from the capital Tashkent. 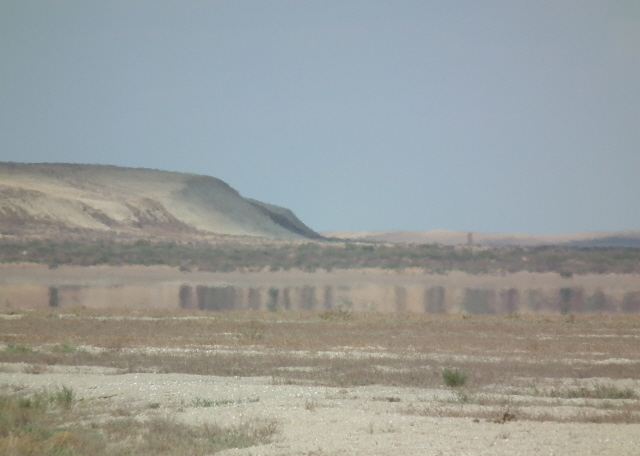 Much closer to Aralsk is another place associated with the Aral Sea disaster, though in a more positive way (from a Kazakh perspective): the Kokaral Dam at the southern end of the North Aral Sea. This dam was opened in 2005 and has since helped increase the water levels, by preventing the incoming waters from the Syr Darya river from disappearing into the Southern Aral Sea. 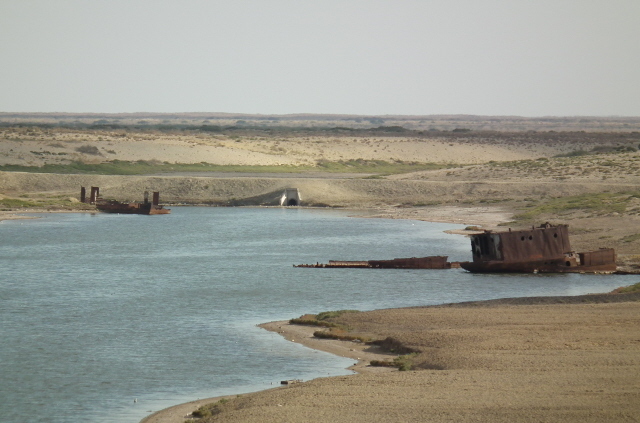 Only occasionally a spillway allows for this when the inflow is substantial enough – but that's hardly enough to reverse the fortunes of the Aral Sea in Uzbekistan, where it has almost completely disappeared by now. I can only guess that the Uzbeks are less happy about the Kokaral Dam, then (even if it is true that the Southern Aral Sea could not have been saved by anything regardless). In that sense the dam can be seen as a partly dark sight too – even though the Kazakhs obviously celebrate it as a great success. And rightly so, given that the waters have indeed risen so substantially since the dam's opening that fish are back, bringing hopes for a revived fishing industry to Aralsk, which is now "only" some 16 miles (25 km) away from the shoreline (about a quarter the distance it was when the Northern Aral Sea was at its driest). Getting to the Kokaral Dam is not at all easy either. It's a long drive from Aralsk, over 100 miles (160 km), and hardly doable as a day return trip, so a camping stopover may be required. In any case, you need a guide/driver with a reliable four-wheel drive car. 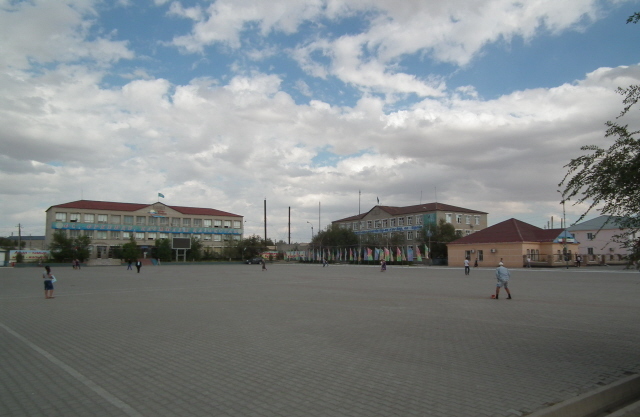 In fact, when I was in Aralsk, such a trip was planned for me – and onward travel to Baikonur was arranged too – but unfortunately it all had to be aborted when my Baikonur tour was cancelled at the last minute and I had to make emergency travel arrangements to get from the Aral Sea back to Almaty instead. So I can't say whether the long trip to the Kokaral Dam would have been worth the effort. One thing is certain, though, it is definitely one way of making sure you actually see any Aral Sea water! Combinations with non-dark destinations: none really – most mainstream tourists would shake their heads at the very idea of contemplating a trip out here. The only non-dark thing there is to do is a bit of swimming in lakes (though not in the Aral Sea itself, obviously), and maybe going for a camel ride. It can make for a distraction from all the depressing remoteness of the area, but would hardly be worth coming here for this alone – especially given that Kazakhstan has way better parts to offer for such nature activities. When I was in the Aral Sea area, such diversions were in fact planned in for my tour, namely en route to the Kokaral Dam. This would have involved staying overnight in a yurt by Lake Kambash east of Kokaral and the Aral Sea proper, and swimming, boating and camel riding were also promised. 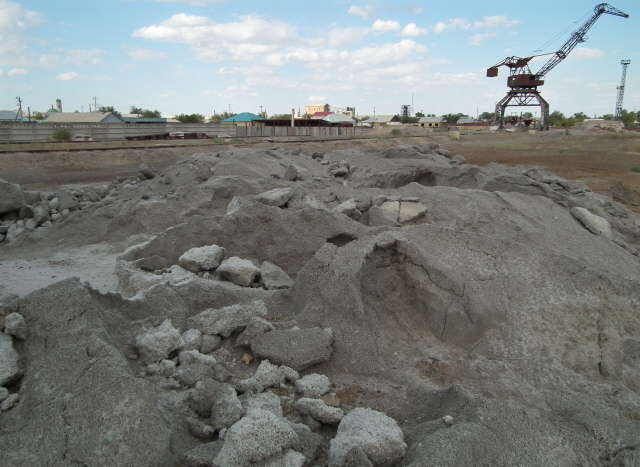 But it all had to be abandoned when my Baikonur trip was cancelled (see above), so I cannot report what it might be like. It would surely have been rather basic – but I regret not having had that little insight into a "typically Kazakh, nomadic" style of living.